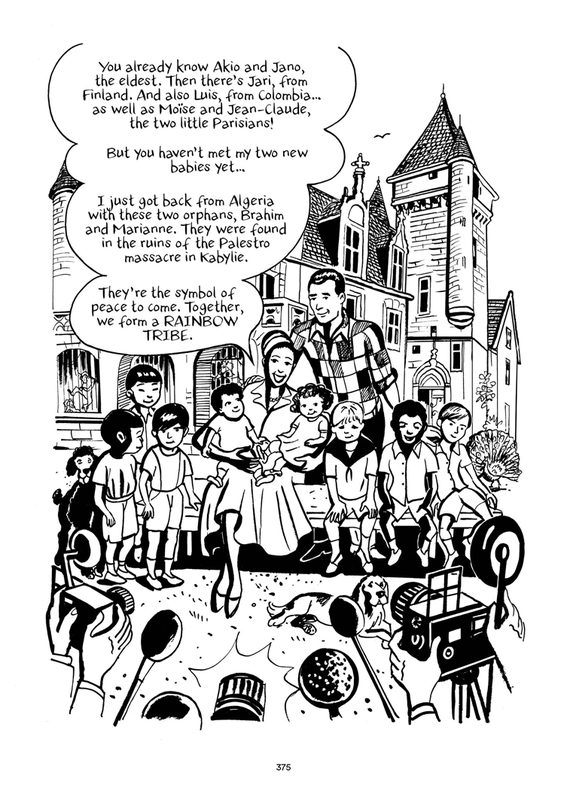 We first met at the Angoulême International Comics Festival, the Mecca of European comics. Catel was an artist. José-Louis was a writer. We were already fan of each other’s work, so the desire to work together came about very naturally. But with a very specific goal in mind: to work only on female characters. At first, we considered doing fiction, then decided it would be more interesting to work in nonfiction and shine a spotlight on women history had overlooked. First, Kiki de Montparnasse, an icon of Surrealism, model and muse to the American photographer Man Ray. Then Olympe de Gouges, a major neglected figure of the French revolution. 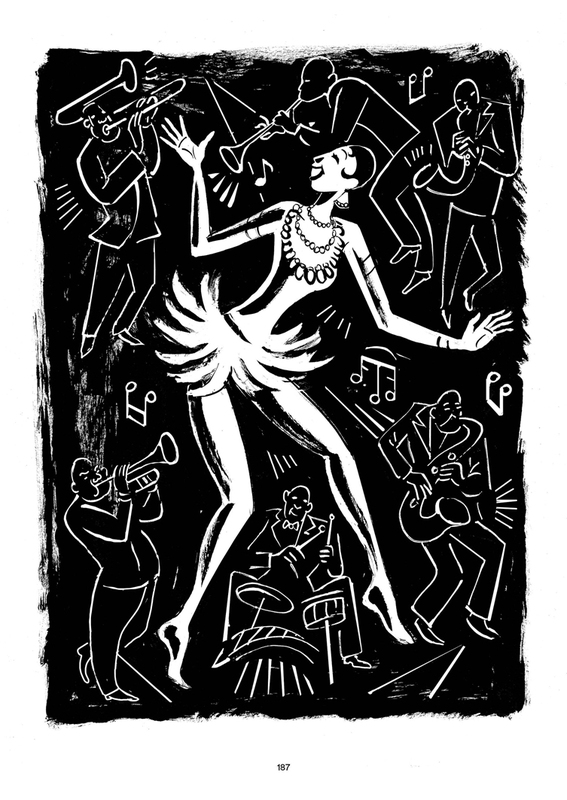 Why did you decide to tell the story of Josephine Baker? Josephine Baker is a unique figure in her field. Not only was she the first worldwide star of color, but she put all her talents and energy to fighting racism. Her experiment with the rainbow tribe – adopting children of all nationalities and continents to prove that all human beings were brothers and sisters, without discrimination – is exemplary. 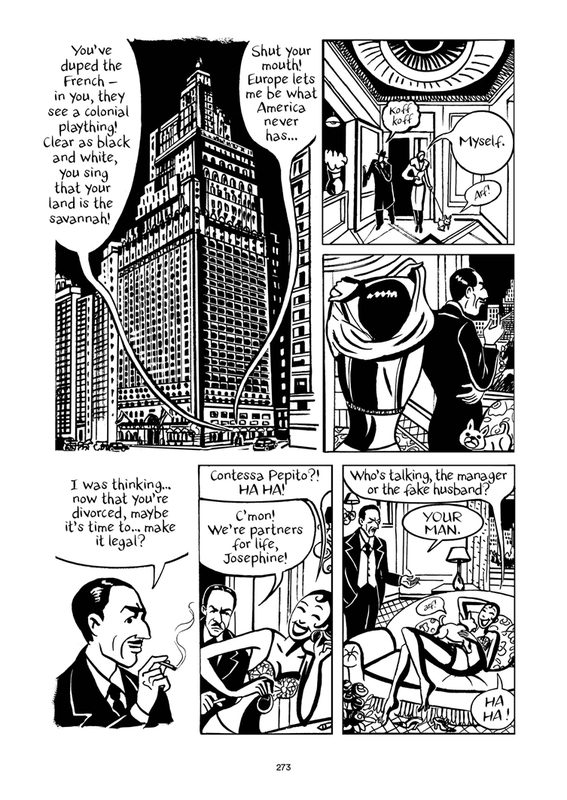 Since our overall project, after telling the life stories of Kiki de Montparnasse and Olympes de Gouges in graphic novel form, was always to help readers male and female alike discover role models in exceptional women, Josephine Baker was obviously a perfect fit for our approach. At first, we didn’t feel entirely legitimate taking on a woman of color – we’re both white – but her son was the one who convinced us his mother’s struggle had always been against such divisions and preconceptions , and that, au contraire, so long as we didn’t betray her humanist message, we were the right people for the job. Why did you decide to tell her entire life? Because this is a very long book and she had a very eventful life. There’s quite a lot to cover. 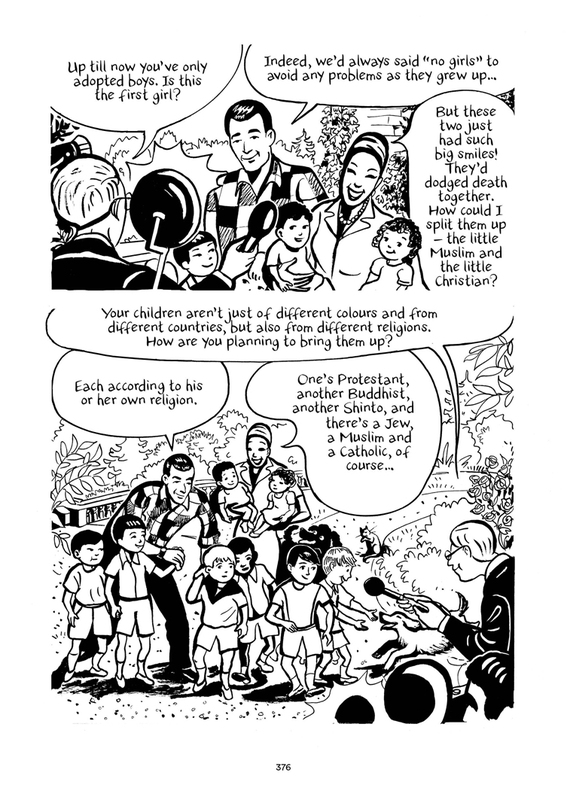 This was our third graphic biography devoted to a historical female figure, and our three books were all based on the same model: telling the story of an entire life from birth to death. We were convinced that in order to understand the actions and choices someone makes as an adult, you have to know about and understand the child she once was. Only going over the greatest hits of a person’s life is to reduce it to anecdotes. To get as close as possible to someone who actually lived, we had to depict the entire arc of their life. True, that wasn’t easy with Josephine, since her life was extremely rich. So we had to make choices with the chronology and focus on the most significant episodes. Was there an aspect of Baker or her life that you felt really needed to be covered either because it wasn’t well known or people didn’t know what really happened? 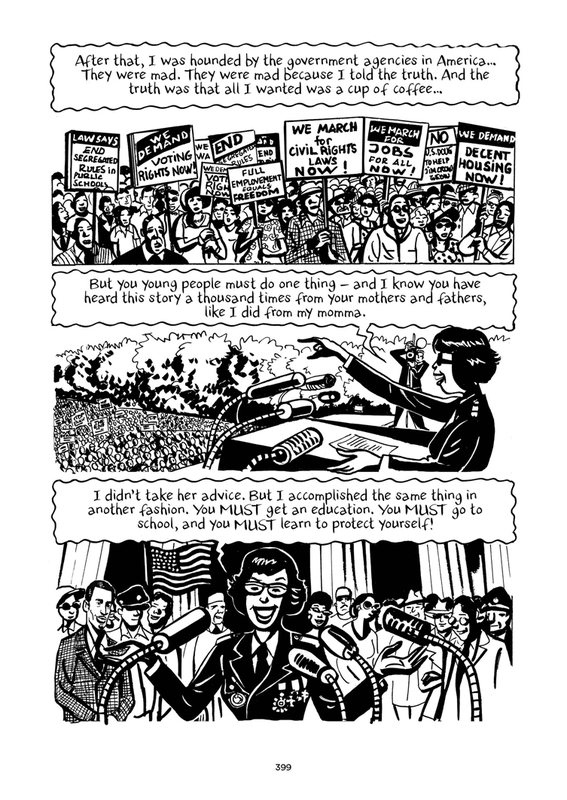 Though many readers will be familiar with Josephine’s life as an artist, because she’s a public figure, her life as an activist is not as well documented. We wanted to shine a light on that. 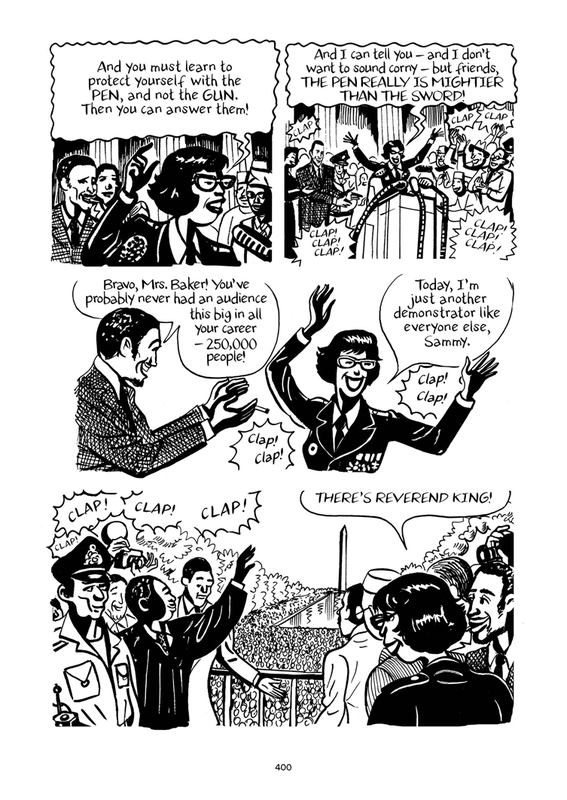 For example, one of the episodes from her fight against segregation given very little attention by various biographers in the last 30 years was her participation in the march on Washington in the company of Reverend Martin Luther King Jr. Everyone had forgotten that she’d come all the way from France in her French Air Force second lieutenant’s uniform to give a speech at the foot of the Lincoln Memorial. It is a speech that historians had completely forgotten, but which is part of the history of the civil rights movement in North America. How much research was required to make a book like this because you include a very long bibliography? And was it easy to get reference material? José-Louis began researching a solid year before Catel started work on the art. Our guiding principle is that, in order to speak knowledgeably about a subject, you have to know every last detail. That means reading not only all the works on the main subject, but also on all related subjects, before writing so much as a single line. The bibliography at the end of the book reflects all our research, When the script was finished and Catel began drawing, she also had to spend many hours researching in order to reconstruct the historical reality of the script as closely as possible. Some of that was books, but not all of it. A lot of the visual research Catel did on site. Which is to say, for the needs of this book, we retraced Josephine’s steps. The different places where she spent her life in France, accompanied by Jean-Claude Baker, one of her sons. But also places in the USA: St. Louis, New York, and Washington. What was the biggest challenge for you in making the book? Managing to tell the story of this extraordinary life in under 2,000 pages! Do you have a favorite moment either from the book or that happened while working on the book? One of the moments that proved most revealing about Josephine’s personality was our visit to St. Louis, Missouri, where she was born and raised. Touring that one-of-a-kind city on foot allowed us to understand the mental environments in which young Josephine grew up. St. Louis was founded by French pioneers, who named it after a French king. That’s no coincidence, in light of the attachment Josephine would later feel towards France. We also discovered that St. Louis had taken in a major German p opulation toward the end of the 19th century. As a result, the train station and many neighborhoods were designed by architects of German descent. Hence a profusion of upper middle class houses with turrets and ogival windows. Which helped us understand how, later on in France, the various places Josephine chose as her homes had been shaped by the peculiar aesthetic of St. Louis. Her villa Les beaux chênes near Paris, and then especially her Château des Milandes in the Périgord region showed the same architectural influence. In France, Josephine was probably realizing her childhood dreams of “middle class” success! These are the kinds of moments related to location scouting discoveries that we found personally moving while making this book. 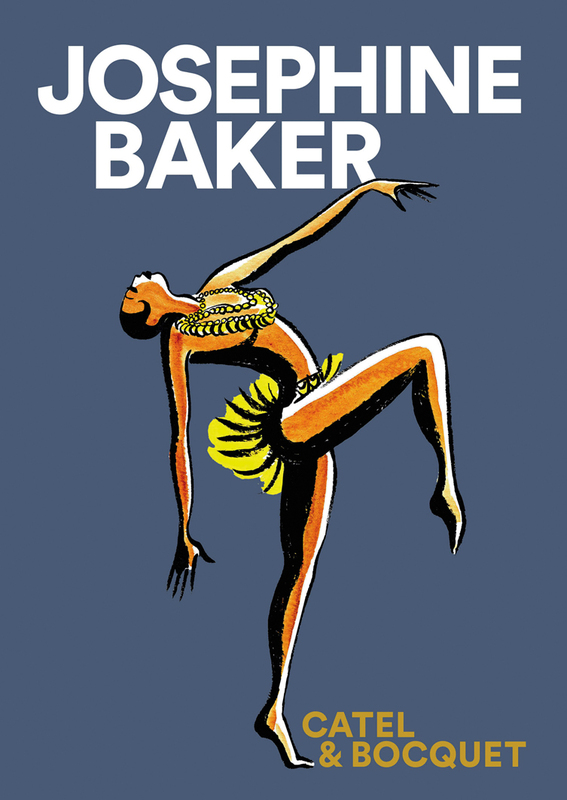 In terms of dance, I know that Baker was in a few films, but how much documentation is there of her dancing? And how did you approach capturing the way she moved? Actually, there’s not a lot of material about Josephine dancing. A few of her shows were filmed, and she’s in a few movies like Zouzou and Princess Tam-Tam. There are also lots of photos. But the main source of inspiration that Catel studied remains the handful of silent sequences filmed onstage. More than a century later, the modernity in Josephine’s gestures and choreography exerts a special spell. To translate this into still images without losing the dynamism of the movements, Catel just kept drawing Josephine dancing again and again and again on dozens on sheets of paper – until her pen had captured Josephine’s energy. 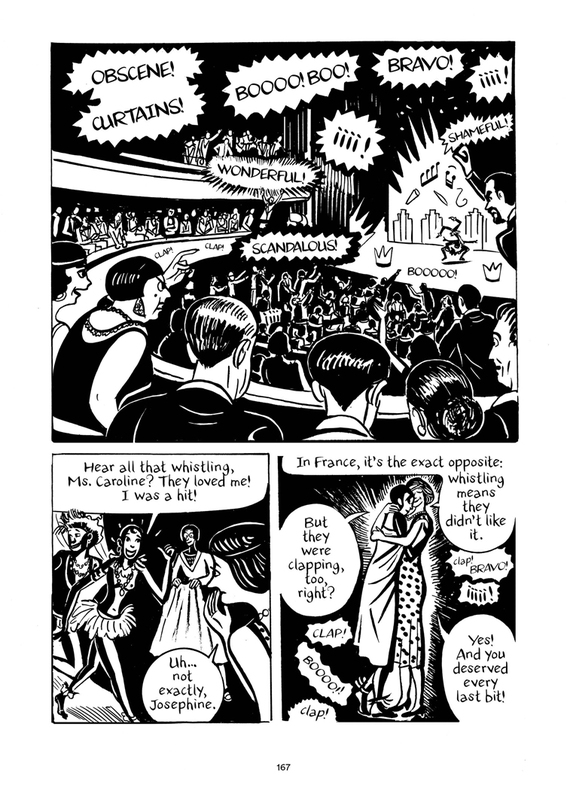 Only then did Catel introduce Josephine’s dancing into the panels of our book. Why did you decide to have almost 100 pages of biographical details and a timeline and other resources in the book? It was a way to tell about things we couldn’t cover in the graphic novel. The dynamic narration we adopted for the comic didn’t allow us to dwell on figures who were just passing through the life of our heroine, sometimes only for a single panel. If it had been a virtual or digital work, all you’d have to do is click on a character, and you could find out everything about him or her via hyperlink. Our biographies at the back of the book are kind of like linked pages. They were a way to find out more about the world of the book by going into all the details of a life. 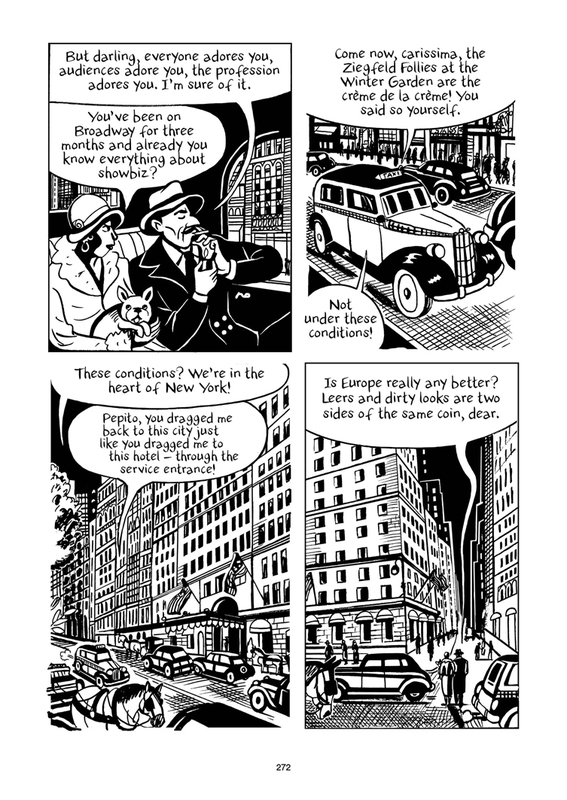 Not every reader knows about the lives of the architect Le Corbusier or singer Sammy Davis Jr. or General de Gaulle or Fidel Castro much less how they crossed paths with Josephine Baker. As an American, I’m curious, how is Baker remembered in France? 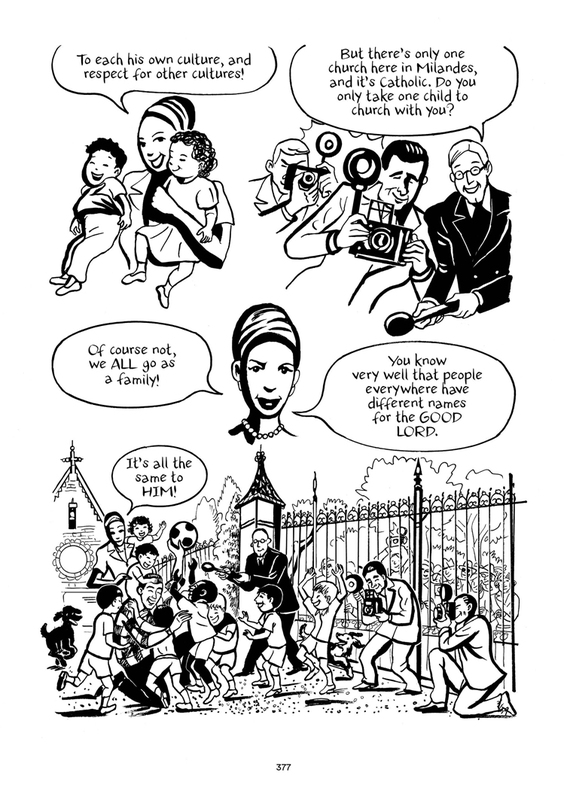 All French people born before the 1960s remember Josephine Baker very vividly. She remained a star till her death in 1975, and the 11 children of her Rainbow Tribe were seen as living symbols of the fraternity between peoples. Today, Josephine is part of the artistic history of France, and is considered a major icon of the 1920s. Our entire goal with this book was to help new generations discover this great woman, an artist, a humanist, and a timeless model of grace and determination.